Sea Glass Enchantments is a chironasium on the docks of Mistral. 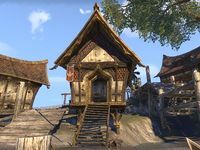 It is a one-room Khajiit-style stilt shack with no doors or windows. An enchanting table is situated immediately on the right from the entrance. A set of barrels is placed on the left-hand side. Across the room there is a Haranwe's desk where a couple of drinks or solvents can be found. A trunk sits beside it. Behind the desk there is a bookshelf which can hold a skill book. A beginner's manual, Enchanting Made Easy, is on the chair near it. Two journals and a book lie on the floor in the far right corner: Journal of Bravam Lythandas, Masterwork of the Inducer, and Ritual of Resonance.